It's a decade since the bankers' insolvency crisis and the median earnings of every single age demographic have fallen significantly since 2008, with the under-50s bearing the brunt of it. In the wake of the bankers' insolvency crisis Labour attempted to mitigate the worst of the damage by propping up the economy through investment, but their efforts were undermined and reversed when the Liberal Democrats enabled the Tory party back into power and helped them implement their extraordinarily damaging austerity agenda. The real Tory objective was to use the bankers' insolvency crisis as an excuse to push through a series of radically right-wing policies aimed at redistributing as much wealth as possible from the majority of British people to corporations and the mega-rich minority who bankroll the Tory party. 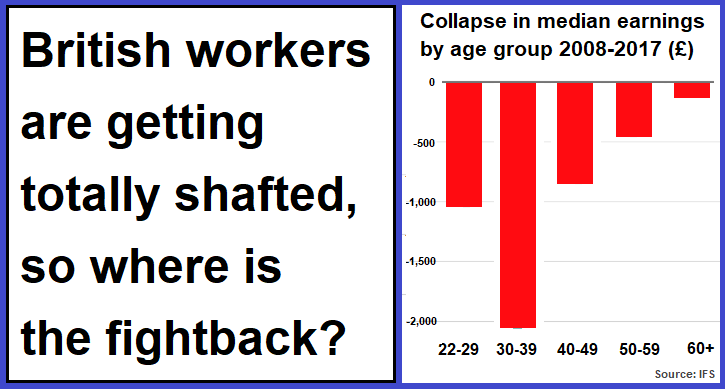 One of the most damaging aspects of Tory austerity dogma of all has been their deliberate programme of wage repression, especially against public sector workers and the under-50s. It hardly takes an economic genius to understand that if you reduce the amount of cash that ordinary people have in their pockets, you end up significantly reducing the amount of demand in the economy and/or increasing the amount of debt as people borrow in order to make ends meet. So not only is the Tory wage repression agenda a disaster for the ordinary people they're driving into in-work poverty, it's also a disaster for the economy through restricted demand and increased indebtedness. One of the most incredible things about this 8-year ideologically driven Tory assault on our wages is the lack of fightback from the British public. Our wages are lower than they were ten years ago. We've suffered the worst level of wage repression anywhere in the developed world except crisis-stricken Greece. The UK is the only developed nation where workers have been getting poorer while the economy has actually grown. The UK is still bottom of the pile when it comes to wage growth. All of this damage to workers' wages was inflicted by choice by the Tory government, not as a result of IMF, ECB, European Commission pressure like it was in Greece, Spain and Portugal. Just imagine if the French government had imposed this crushing wage repression agenda on French workers. There'd be strikes. There'd be protests. There'd be riots in the streets. They'd probably even blockade Britain with tractors and wagons! But here in Britain the Tories who ripped off millions of British workers in order to enrich the already extraordinarily wealthy actually saw their vote share increase dramatically at the last election. The lesson here is that the wealthy establishment class can blatantly rip off British workers, and millions upon millions of us will actually flock to the polls to thank our beloved lords and masters for mistreating us in this way!